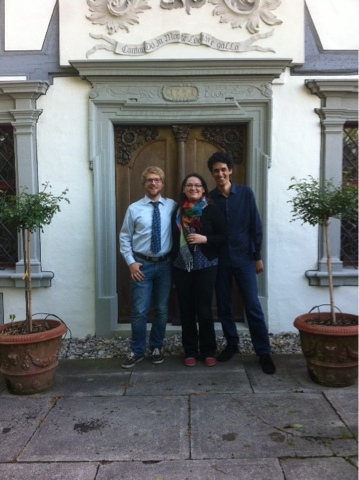 Last week I performed my first professional recital in the greater Switzerland. Along with my friends Alexandra and Ziv, I performed a program of a variety of obscure works for bassoon, including a piece of my own. The venue was a 16th century Schloss in Hahnberg, near lake Constance. The building was incredible in that it was owned by a man who is a professional architect specializing in the restoration of 'ancient' structures. His Schloss, which he restored himself, is now in immaculate condition. The concert room, about the size of a small living-room with a vaulted ceiling, was originally a kitchen until it was renovated in the 17th century. Most worrisome for an ensemble consisting of archlute, viola da gamba, and bassoon is balance. Though in a rehearsal setting balance isn't necessarily a primary concern (as we weren't rehearsing at the venue), we were conscious that I could easily overpower the group in a loftier acoustic. Furthermore, Alexandra and I were to play Couperin's 13e Concert, from Les Gouts-reunis, a piece which can be problematic when played by a bassoon and gamba. Entering the concert room which was bursting with fifty spectators, I was curious to hear what the group sound would be. When we first arrived we got an idea of what to expect, but the presence of a crowd can have a huge impact on the acoustic. Playing the first notes of the program we were delighted. Not only was the balance excellent, but the proximity of the audience and their investment in the performance made for quite the experience. Coming home on the train the discussion centered on the concert room. So rare is it these days that we get to perform chamber music in the very kind of room known to the composers and amazing it was that our primary concern that day was vanquished by it.